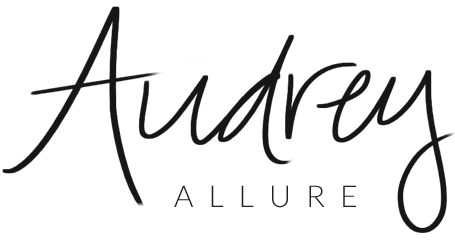 Audrey Allure: Day 1 & 2 of New York Fashion Week ! Day 1 & 2 of New York Fashion Week ! Day 1: Amazing first start to the week. Got to work early; me & Jessica wore the sponsored DHL turtleneck dresses which helped us stay warm since we were in the lobby right next to the doors. Although, all of us Daily girls (and guy [Cody]!) went to the McCafe booth to get some free hot chocolates, coffees, frappes, cappuccinos, etc. to also keep us warm. The day went by really fast. By the time we looked at the time many hours have elasped already. We were all there working from 9:30am - 9:30pm and it didn't even feel that long. Saw some familiar faces and it was definitely nice seeing everyone again and meeting new people. 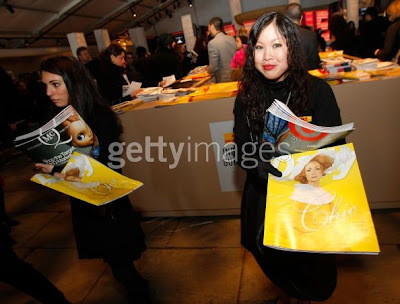 Our job is to pass out the Daily Front Row Magazine, which is the magazine that comes out every Fashion Week that tells you what happened the day before and the day of. We were also passing out buttons (for the first time), that said "Chic must go on!" to correlate with our Daily Magazine of the day. During our breaks, we also got our Mercedes Benz Fashion Week giftbag! (only allowed for press and paid employees) I love the bag that it's in this year. It's a hot pink tote bag which says Mercedes Benz Fashion Week on one side and the other side is Barbie! The main theme of this Fashion Week. In the center of the lobby, there's the word Barbie spelled out around filled with tons of Barbies, surrounded by a bunch of pink apples. Day 2: Valentine's Day! I wasn't scheduled to work today, but I decided to go anyway just to watch the most anticipated Barbie Fashion Show!! I brought my boyfriend, Andres, with me inside. Drank some hot chocolate and watched the Barbie show. It was AMAZING. I loved it all - from the clothing, the hot pink shoes, the hair, the makeup, the look-alike Kens, to the finale walk with the little girls in their tutus. 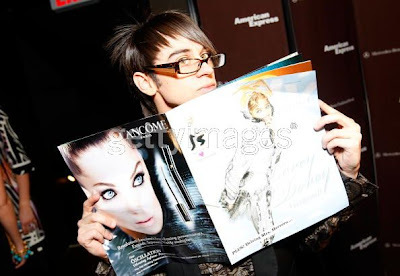 And remember my previous blog post, about hoping to meet Christian Siriano? Well, I got close. I saw him on the first day of Fashion Week while working, and I also saw him the second day reading.. the Daily Front Row Magazine! Oh btw, I also spotted Diane von Furstenburg! She smiled at me while we were walking past each other in the main lobby. and what a way to celebrate valentines day!! How cool! Fashion week looks awesome. 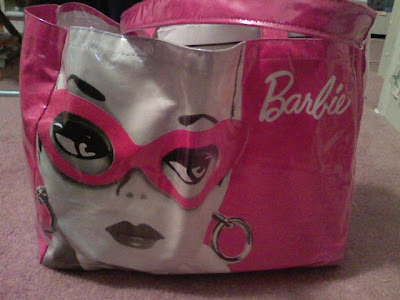 :] I love the Barbie theme, my mom would totally freak out if she saw those. And how amazing is it that you got to see Christian and Diane! :o How many more days are you going to be at fashion week? i'm glad to hear you're having fun working fashion week!i volunteered at Miami Swim & it's such a rush just being in that atmosphere.